Happy Monday, friends, and I’m so glad that you enjoyed my thoughts on the mini-trip home. On Friday, I’ll be celebrating Passover with some chosen family: my closest friend from college, Jordan, his parents and his siblings. I felt close to Jordy’s family even back as an undergraduate, in spite of the fact that I only met them a few times. They were warm and kind and easygoing with invitations and overnight stays. I was young enough and only child enough that the fact of Jordy’s having two siblings seemed kind of wonderful to me—three kids under one roof! Over the years I’ve been lucky enough to become close to his sister and brother, too. Jordan’s parents feel strongly about welcoming, hosting, and building family. Over the years they’ve had me in their home for countless holidays and gatherings, and now they include my mom, too. As someone who has a small nuclear family, the generosity of spirit never goes unnoticed, and it means more than I can say. An added bonus of holidays with Jordy’s folks is the fact that I’m usually not the only plant-based eater present (his sister-in-law’s family is plant-based), and Jordy’s mom is especially curious and open-minded about preparing dishes that can suit a wide variety of eating styles. She always welcomes me to contribute a vegan recipe to holidays. At Rosh Hashana, this means a crown-shaped loaf of Isa Chandra’s challah. And at Passover, it means the challenge of something plant-based and also grain-free. Grain free baking is hardly my specialty; I’m a grain-loving gal, and in spite of being pretty dextrous with gluten-free baking, nut and other grain-free flours aren’t my favorite. Still, my love of dessert is much more powerful than my lackluster feelings about baking without grains. I’ve been experimenting in preparation of the holiday this year, and this grain-free vegan pistachio coconut lemon cake is the result. I owe this recipe—pretty much all of it—to the wonderful Lindsay of Cotter Crunch. She’s one of my go-to resources for recipes that work for a wide variety of specialized eating styles: hers are always gluten-free, but they’re often grain-free and/or plant-based, too. Not too long ago, Lindsay posted a grain free vegan white cake recipe. As someone who has had very little resounding success with grain and egg-free baking, I was super impressed with how fluffy and delicious it looked. A couple weeks ago, my preceptor and I were chatting about Passover recipes, and she mentioned this pistachio cake by Julie Powell. It looked beautiful, but I knew I’d need to tweak it considerably to make it vegan. I thought back to Lindsay’s cake, and I wondered if I couldn’t create some sort of amalgam of the two. In spite of my limited track record with recipes like this, I’m really happy with how the cake turned out—happy enough that I plan to bring it to the seder this week. Yes, it’s got a dense texture, just as I suspected it would. But it’s still light and tender enough to work—not gluey, as some of my vegan grain-free experiments have been. The lemon glaze gives it just the right added layer of sweet tartness, and the flavor of both nuts and coconuts really does shine through. Here’s the recipe. Preheat your oven to 350F and line an 8″ square or springform round pan with parchment. In a large mixing bowl, whisk together the flours, pistachio nuts, arrowroot, baking powder and soda, salt, and sugar. Separately, whisk together the oil, lemon juice, syrup, water, and vanilla. Add the wet ingredients to dry, and whisk together till the batter is smooth. Immediately pour the batter into the baking dish and transfer to the oven. Bake for 45-50 minutes, or until golden brown. When the cake is ready, allow it to cool for a few hours on a wire rack. When it’s room temperature, whisk together the lemon juice and confectioners’ sugar. Pour the glaze over the cake and spread it gently with a spatula, if needed. Top with chopped whole pistachio nuts. Transfer the cake to the fridge and allow it to set for another 2-3 hours (or overnight). Cut and serve! My recipes have been pretty loosey goosey this year, with lots of invitations to modify as you like. I tend to be more precise with baking, but for this recipe—given the considerations of no gluten, egg, or grain—I’d definitely encourage you to follow the recipe precisely if you make it. 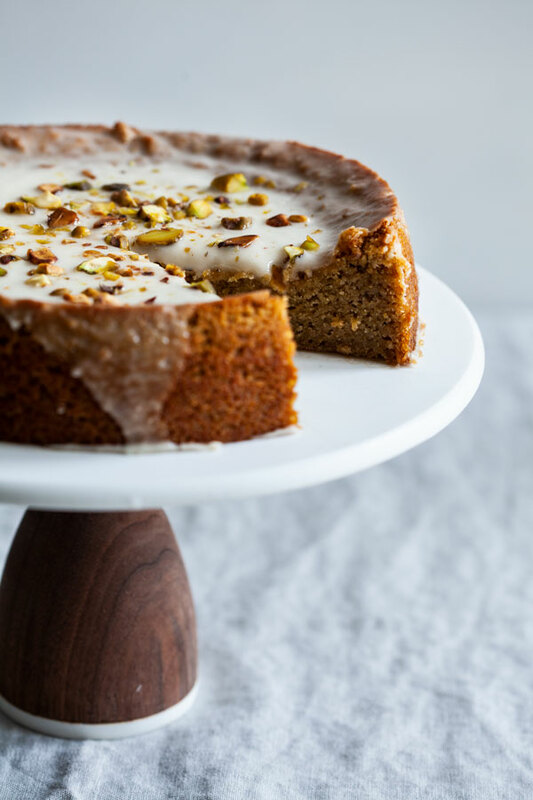 The one exception is that you can definitely substitute all almond flour for almond+pistachio if that’s what you’d like to do, turning it into a coconut almond lemon cake. And of course, this is a Passover cake for me, but it would be a lovely Easter offering, too, or a good contribution to any spring gathering: shower, brunch, whatever. In the spirit of chosen families and holidays, I wish you a wonderful week ahead. And if you make this one, happy baking! The post Grain Free Vegan Pistachio Coconut Lemon Cake appeared first on The Full Helping.